The EcoShpere is not really a new discovery; they’ve been around for a number of years but the idea doesn’t seem to get old with us. 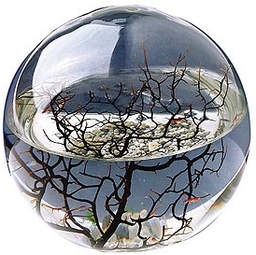 The EcoSphere is a tiny, completely enclosed ecosystem that is contained in a small orb between 3 and 9 inches in diameter. Inside the EcoSphere are tiny shrimp, algae, filtered sea water, gorgonia, gravel and a magnet. If you keep your tiny world in a moderate amount of sunlight or artificial light and maintain the desired temperature, the living organisms will usually keep the system alive for 2-3 years, but some have been going as long as 8. Basically the cycle works like this: light energy grows the algae inside the Ecosphere. The algae create oxygen and food which the tiny shrimp need to survive. The shrimp make some organic waste from eating the algae which creates some bacteria that along with the shrimp themselves creates carbon dioxide and nutrients for the algae to grow. The gorgonia and rock are used for the algae to grow on and the shrimp to live on. The magnet is used in combination with any other magnet outside of the sphere to clean the inside. As you attract the inner magnet you can move it around to clear any excess algae off of the inside of the glass. The magnet has nothing to do with maintaining the actual ecosystem. The EcoSphere’s cost anywhere from $79 to almost $500 depending on size, and if you get your hands on a retired system where more than likely all the shrimp have passed on, you can get it recharged for quite a bit less than a new one.